Led by educators and centered around human relationships. These beliefs manifest in many of the features students in our lab schools experience every day. For example, our belief that school will be more about learning how to learn leads us to pursue a more project-based approach to learning that values depth, and encourages students to follow emerging interests. Projects follow our learning cycle, and culminate in the exhibitions that showcase students’ learning at the end of each trimester. Read about a learning exhibition: A Hero’s Journey to Developing Grit and Reading and Writing Skills. Our belief that schools will be more flexible means we are exploring ways to ensure all students master essential knowledge, skills, and habits—but can do so in different amounts of time, with different amounts of support. Today, this manifests in features like multi-age groupings, and the pursuit of competency-based milestones that replace traditional grades. This is why we call our schools lab schools. 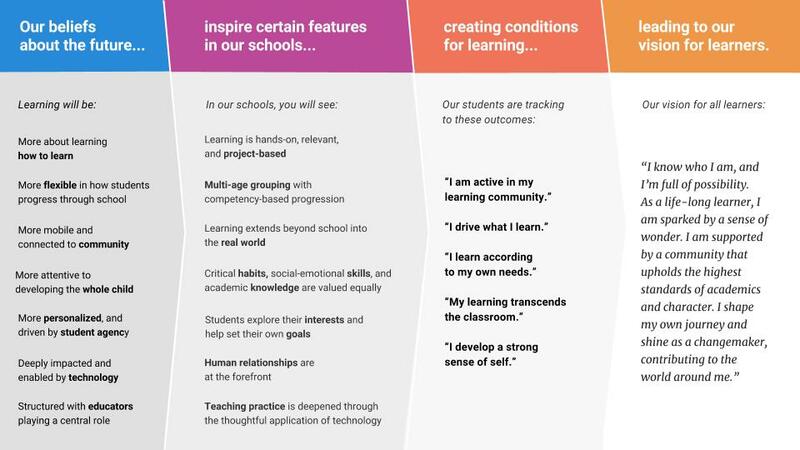 Not because we are experimenting, collecting data, or building technology (although that is an important part), but because we are figuring out how to bring these beliefs to life in a way that is meaningful, rigorous, and possible to scale with the help of the AltSchool platform.